Wild Ireland / Éire Fhiáin, the two part series made by Crossing the Line Productions has enjoyed a number of international sales and award nominations around the world. 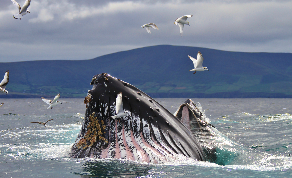 Showcasing the wildlife and transcendent beauty of Ireland's Atlantic coast, the series has already been nominated for an award at Jackson Hole, the world's most prestigious wildlife film festival based in the US. Competing against the likes of Planet Earth 2 and The Hunt, Wild Ireland has also just received nominations for both - the Grierson and Royal Television Society Awards, two of the UKs most prestigious awards. Wild Ireland debuted to over 2.9 million viewers on the BBC as well as being broadcast as a two hour special on PBS in the US and proved a massive success with over 2.5 million viewers tuning in to watch. Funding and supporters of the series include TG4, BBC NI, ORF, PBS, NDR, France TV & Creative Europe along with future broadcasts who are also confirmed on SVT & YLE in Scandinavia and SBS in Australia amongst many others.